The primary Marine Corps base on the West Coast, located in San Diego, California. It was established in 1942 during World War II. This base was named after Major General Joseph Henry Pendleton and was originally built to be a temporary facility, but by the end of the war had been designated a permanent installation. 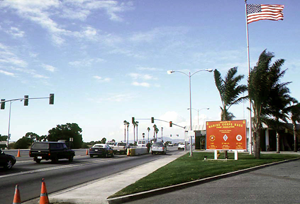 "Main gate of Camp Pendleton, Calilfornia, November 12, 1997" by SSGT Richard P. Tudor, USMC is licensed under Public Domain.